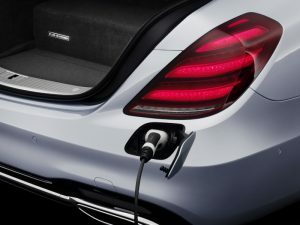 Mercedes-Benz has boosted the range and charging times of the S-Class plug-in hybrid, previewing technology likely to be rolled out across its other plug-in models in the near future. The new S-Class PHEV offers a 50% longer electric range than its predecessor. Unveiled at the Frankfurt Motor Show, the S 560 e will replace the outgoing S 500 e, for the first time using batteries sourced through Daimler subsidiary Deutsche Accumotive, which was founded in 2009. Developments in cell chemistry since the S 500 e launched in 2014 have enabled the battery capacity to increase from 8.7kWh to 13.5kWh, in turn boosting the range from 18 miles (NEDC) to 31 miles, while cutting CO2 emissions from 65g/km to 49g/km. Despite that increased capacity, the battery is physically smaller than its predecessor, and the power electronics have moved from the boot to the engine compartment. This has enabled the luggage capacity to increase slightly, from 395 litres in the old car, to 410 litres. Charging rates have also doubled, from 3.6kWh to 7.2kWh. Expect the new battery technology to be rolled out swiftly across the rest of the Mercedes-Benz plug-in hybrid range, likely to start with an updated C-Class due next year. Already the UK’s second biggest-selling plug-in, outselling the LEAF, the petrol-electric C 350 e will be offered alongside a diesel plug-in hybrid in the near future, with a view to broadening its fleet appeal. Both could offer a range of 30 miles with an increase in battery capacity. Not all Daimler plug-ins will use petrol or diesel engines. On show alongside the S 560 e, the GLC F-Cell combines a mains-rechargeable 13.8kWh Deutsche Accumotive battery (a capacity increase of more than 50% compared to the petrol-electric GLC 350 e plug-in hybrid), offering a 30-mile electric range, with a hydrogen fuel cell system. The EQA concept, meanwhile, hints that a fully-electric drivetrain could be offered in the next A-Class.